It is a never-ending crusade to keep a dirk bike clean. 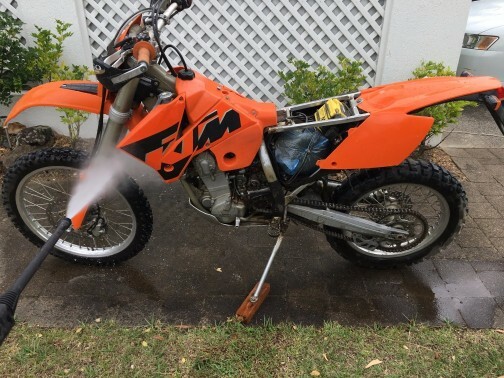 Ideally, you should wash your dirt bike as soon as you get home. It’s much easier to get the mud off, and there’s less time for corrosion to start happening. Washing your dirt bike is the first step before doing any maintenance on your bike. 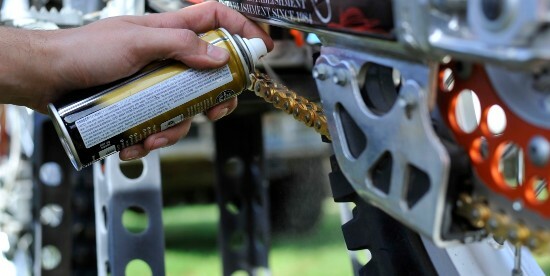 It will keep your bike looking good and lasting longer. There’s a lot more to cleaning a dirt bike than spraying a hose on it, then hitting it with the WD40. 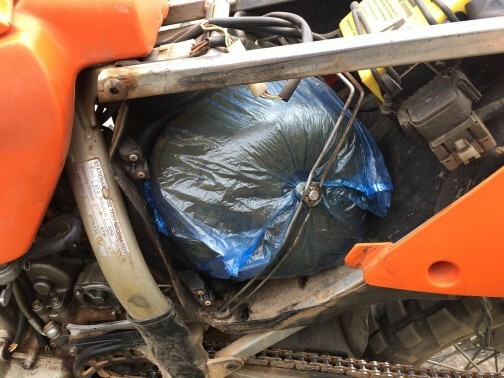 It always makes it easier to remove the seat, side cover, and sometimes radiator shrouds if it’s been really muddy. This allows better access to the engine. Directing the high-pressure water at the seat will soak the inner foam and deteriorate it, so this is why its best to remove it. Remove the engine bash plate if it has become clogged with mud. Insert a Muffler Wash Plug into the exhaust to avoid getting water into the exhaust. 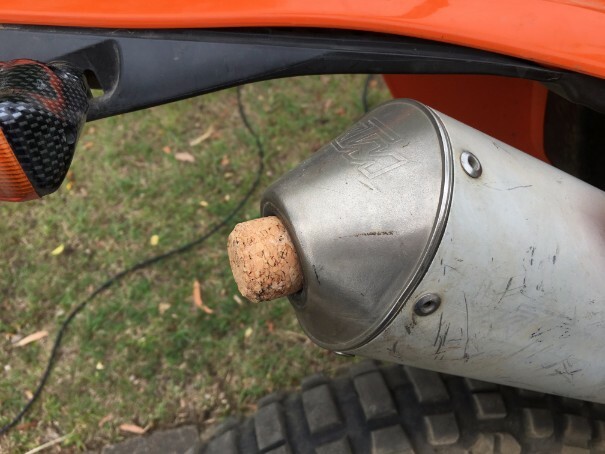 There’s several on the market, but an old wine bottle cork does the job if you don’t have one. Remove the side plate covering the air filter so that you can clean inside the airbox. Remove the air filter and cover it with a plastic bag, and refit the filter. This will prevent water from getting into the carby. Use a rubber mallet to knock the dried mud off the tires if it’s been really muddy. Avoid using a scraper to remove dried mud from the plastics or it will scratch them. 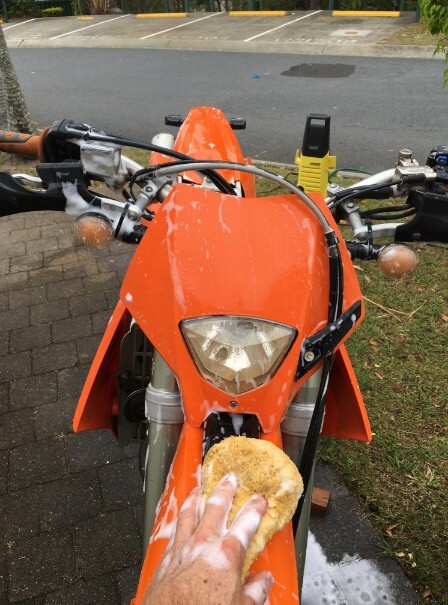 Once you’ve finished prepping the bike, spray on a good wash detergent and let it soak in. Muc-Off has a good range of motorcycle cleaning products. Do yourself a favor and get a good high-pressure washer, it makes the job a whole lot easier, and does a much better job. The garden hose may be fine for the family car, but not for a dirt bike. 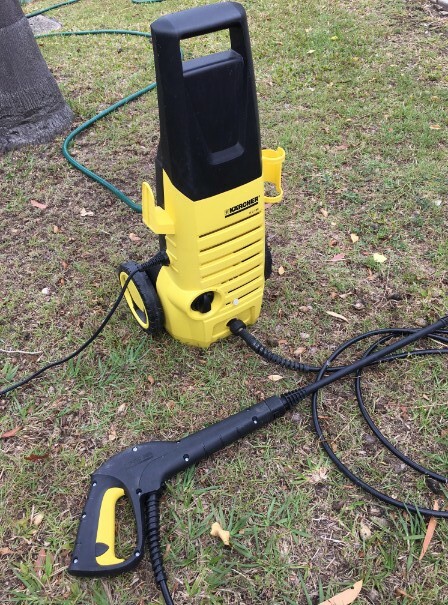 I use a Karcher K2 1600psi which I find has enough pressure to clean a dirt bike. Lay the bike over on its side with the handlebar resting on the bike stand. This allows you to get to those hard to reach areas like under the engine, and inside the mudguards. It may be necessary to remove the skid plate if it has been a really muddy ride. Avoid hammering the chain with high-pressure water. It’s best to scrub it with an old nylon-bristled brush, then rinse it off. Now put the bike upright on the stand and spray it from top to bottom. Avoid directing the water around the carby, steering head stem bearings, suspension linkages, wheel bearings, and front engine sprocket. Once you’ve finished with the water blaster, get out the sponges and brushes and start scrubbing. 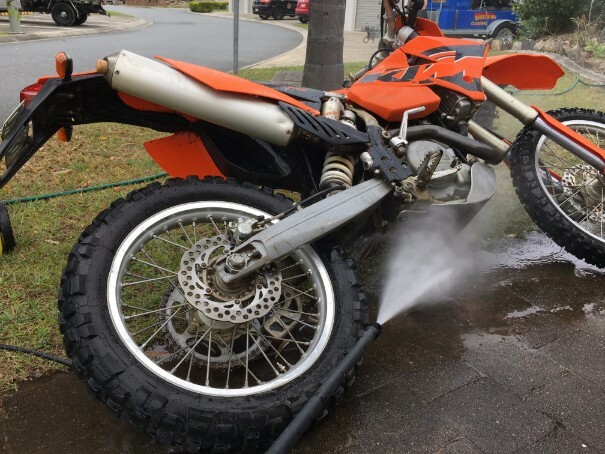 The tires are especially hard to get clean with the water blaster, especially if you’ve been riding in clay, you will usually need a hard scrubbing brush. An old toothbrush is ideal for getting into those hard-to-reach places on the engine. A degreaser can remove the build-up of grease and gunk around the front sprocket. You may have to remove the sprocket guard to get better access to it. 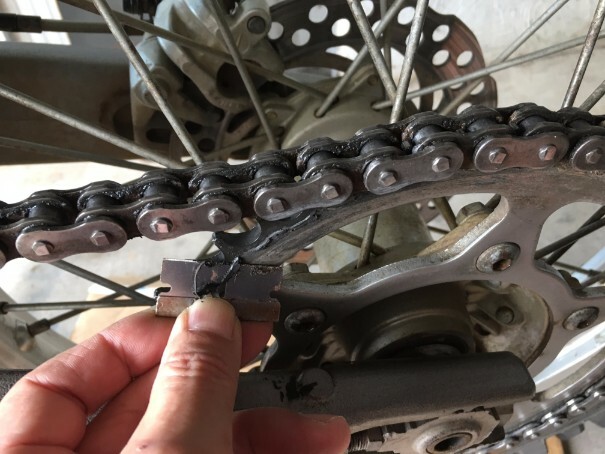 An old razor blade is great for removing gunk from the sprocket. Once you’ve finished washing, it’s a good idea to spray WD40 or RP7 on anything that’s likely to rust and to dissipate the water. Avoid getting any spray on the brake discs. Dry the bike with a clean towel and rags for those hard to reach places. Use a clean cloth on the lower fork legs and inspect them for any signs of oil leaks or scratches or nicks. Dry the brake discs with a clean rag to prevent rust from forming. Spray the chain with chain lube. Refit the seat and shrouds. Remove the plastic cover from the air filter, and give the bike a run. I like to take it for a short ride and use the brakes a bit to heat them up and dry up any water around the engine. To keep your plastics looking good, I have found that spraying them with a silicone spray makes them look new again, and helps keep mud from sticking, making cleaning easier next time. Before the next ride, I always clean the air filter, especially if it has been a dusty day’s riding. Do you have any tips for cleaning your dirt bike? Please feel free to share any thoughts you have with readers.